Jeff Munoz, is a devotional singer, artist, writer and co-founder, developer and caretaker of Tara's hermitage. Jeff’s first spiritual teacher ~ Daddy Bray, one of the last great Kahuna of Hawaii ~ adopted Jeff as a son in 1967 and shared of his wisdom up to his passing. In 1972 Jeff received darshan blessings and teachings in India from such great gurus as Sathya Sai Baba, Neem Karoli Baba, and J. Krishnamurti. In 1974 Jeff met and received teachings from Venerable Kalu Rinpoche on the island of Maui. Jeff assisted Venerable Gyaltrul Rinpoche on Maui in 1976 with the construction of the first enlightenment stupa in the western world and received blessings and teachings from the 16th Gyalwa Karmapa and Jamgon Kontrul Rinpoche. In 1981 with the blessings of the 16th Karmapa, Jeff co-founded and developed with Lama Karma Rinchen, Kagyu Dhechen Hermitage stupa and temple where he has since resided as caretaker. 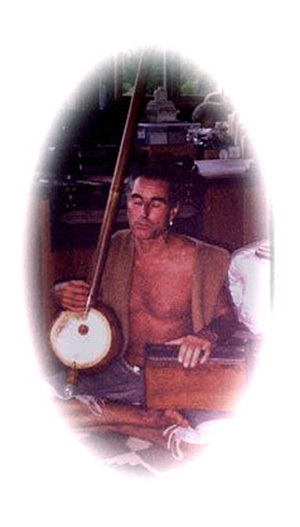 In 1985 Jeff’s devotional chanting inspired the creation of the Mandala Dance of the 21 Taras by Prema Desara, for which he provided his chanting and music for twelve years. The dance continues to be taught and practiced around the world. Jeff began receiving teachings in 1993 from Khenpo Tsultrim Gyamsto Rinpoche who remains his principal teacher. Jeff Munoz and Christina Richã Devi organize the Tara Retreat in Hawaï together. More information about Christina Richã Devi here.